In just over a week, children and families will descend upon local, state and national parks to celebrate Kids to Parks Day. The event, being held on May 16, 2015, marks the fifth year that the National Park Trust has encouraged children and families to get outside for play, exploration and adventure. Visit kidstoparks.org to make the pledge to plan a trip to the park on Saturday, May 16. Just by making the pledge, you’ll be entered into a drawing for a Nikon COOLPIX L830 camera. And while your there, you can browse a listing of park events by state and city to find one near you. Or find a nearby playground on playlsi.com that you can go explore. According to the National Park Trust, Kids to Parks Day is becoming America’s unofficial kick off to summer. So mark your calendar and plan to get out and play on May 16! We read so many great essays when deciding the winners of the Together We Play™ contest, and want to share with you excerpts from the winning submissions. Here is part of what drew us in to learn more about the Sensory Garden Playground Initiative at the Wheaton Park District in Wheaton, Ill. 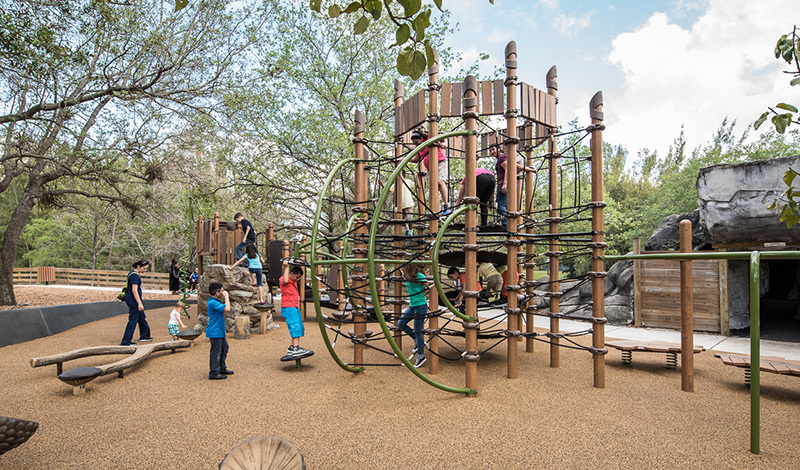 Imagine the sounds of happy children running, climbing, swinging and digging, while parents chat nearby. Imagine the relaxing atmosphere of unstructured play which encourages problem-solving and socialization among peers. Imagine entire families enjoying recreation together. Now imagine the nightmare a park can be for families of children with sensory processing problems–too much noise, too much contact, no place to withdraw safely. Imagine the panic of parents when a child on sensory overload runs away, or the embarrassment when their child becomes overwhelmed and bites or hits another child. Imagine a family’s frustration at not being able to enjoy a park atmosphere because the facility isn’t safe and welcoming for a child with special emotional needs. We imagined all this and more. Then we saw a safely fenced play area with room for children to spread out, surrounded by a fitness trail for adults. We saw surfacing where wheeled devices move easily and equipment is designed to engage sight, hearing, smell, movement and touch. We saw places where a child can withdraw easily and safely, so that each one can learn to regulate his or her own sensory input. We saw a welcoming place where whole families can relax and engage and enjoy their time together. We saw the need for a multi-community effort to build a world-class facility, and we are ready and willing to lead in making it a reality. Now that Stephani Victor, Paralympic gold medalist and Together We Play™ essay contest judge, has finished reading the essays, she’s even more in awe of those who submitted them. It has truly been an honor and rewarding experience to contribute to this most generous award opportunity that I know will be embraced whole heartedly by the winners. I learned a lot through this process. I cried, I felt people’s loss and community need. I felt their frustration with failing budgets and poorly maintained or inaccessible playgrounds in existence. But most importantly, I felt their passion, their commitment and authentic motivation to bring people together for the purpose of play. I have thought a lot about “playing” and what that means in my life, how it has shaped my life and how we have a responsibility as a society to ensure everyone has an opportunity to “play.” It’s important that we provide a place for everyone to go that is safe, where they can explore, grow and develop their imaginations and, ultimately, their sense of self. I am also deeply affected by the idea of inclusion and what that really means. And how damaging exclusion can be, even if it comes from well-meaning parents who want to exclude able-bodied children from playing with their child with special needs because they are trying to protect them. Ultimately, any exclusion has negative consequences for everyone. I am so committed to the exploration of inclusion–in life–for adults, too. I am really grateful to you for sharing your insights and educating me. I have mountains of respect for you and your teammates, who are so committed to making a difference in lives of so many. Lastly, I appreciated the reminder that each of us gets to create our community and if we would like things to change, we need to start with ourselves. As we go through the internal judging process, I am so overwhelmed. The amount of time, energy and emotion that have gone into these essays is incredible! I can’t believe all of the communities that want to come together through play. Not just any play, but play for all–free from physical and social boundaries. 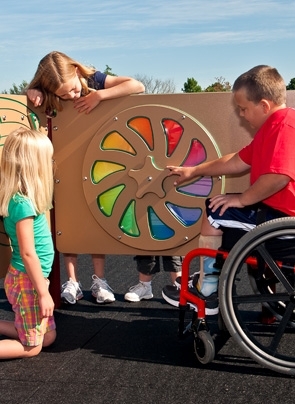 Communities have put together organizations to not only bring inclusive play to their community, but also educate the population on the differences of individuals’ abilities and how to embrace them. Everyone that submitted an essay wants to bring play to all children in their community. Some want to dedicate the playground to someone special, others want to build it in memory of someone. Many essays focus on providing inclusive playgrounds not only so all kids can play together, but also parents/guardians and grandparents can play with the kids in their lives. I have been reminded many times over of all the military moms and dads, who so courageously fight for our continued freedom, and then come home to their families with different abilities. Many now use mobility devices and can’t easily play side-by-side with their children on the playground. Each of the essays submitted are so deserving of an inclusive playground. Our team of judges sure have a tough job ahead of them. Check back with us in the next few weeks to get their thoughts about reviewing the essays.